It occurs to me she may have been a con artist, not just a simple card reader. I’m imagining what it must have been like to ask someone for $500 in 1902 for divination. Starweaver – You are probably right. There are some incredible stories of the large amounts of money con artists, both male and female, have been able to obtain from ordinary people. Still, it’s strange that she was convicted of witchcraft and not of running a scam. It was also strange to hear her called “an old woman” when she was the same age as I am now. I agree the last is supremely strange. I’m tempted to see it in karmic terms: being a scam artist ages one hideously beyond one’s years, while being a bright-spirited tarot teacher ensures an ambiance of youth for decades. Or perhaps it’s something to do with the life expectancy for US women being 49 years in 1900 and 81 years today. Did anyone reduce the date? It equals Key V. I found that interesting. I also noted that the charges do not equal the crime, even if you assume the date the act was committed. Shouldn’t the crime had been fraud? Thus I would have to say that if she could make $500 reading cards, more power to her! Annie – Thanks for reminding me about figuring out the cards for the date, but you are right, they reduce to a 5 and before that to a 14 (when adding the month, day and year like a school math problem). I would see it, therefore, as Temperance and Hierophant (1+9+2+2=14; 1+4=5). The suspended sentence suggests Temperance’s compassion. The Hierophant might be making a point that the secular authorities were unaccountably treating this as an issue of heresy (witchcraft) rather than as illegal fraud (as you noted). Strange, to be sure. I’d love to know more about the circumstances. 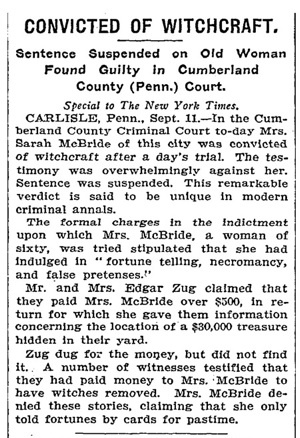 What is most terribly interesting about this article is that Ms. McBride was apparently engaged in some protypical activities of the old British “cunning folk”. Finding treasure, breaking bewitchments, and divination were all in the cunning folks’ standard repetoire of services. The most glaring omission is the provision of folk cures for people and animals (though removing bewitchments is actually a related endeavor). Is this coincidence, or was Ms. McBride’s avocation an example of the survival of the cunning folk tradition on American soil?